Inspired by the Statue of Liberty Dollar, these brilliant uncirculated rounds contain one avoirdupois ounce of .999 copper. The front is embossed with the Statue of Liberty, an enduring American symbol of freedom. The edge is inscribed with “United States of America” The reverse portrays the Great Seal of the United States. Originally designed in 1782, the Seal vividly portrays an American Bald Eagle, symbolizing strength tempered with wisdom. This coin is 1/2 oz of fine copper bullion. 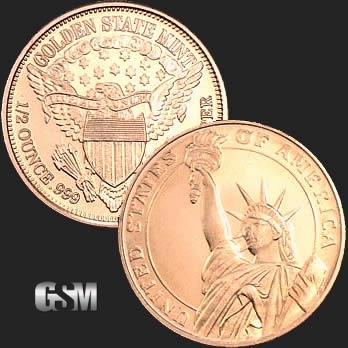 It is produced by the Golden State Mint in jewelry grade copper. It is a fine addition to any collection. If you liked this product, you should check out our 1/4 oz Copper Statue of Liberty, 1 oz Copper Peace Dollar, and 1 oz Silver Morgan.